We believe the church is for all people, including children, and we want Colleyville to be a church where children are both seen and heard. Please don’t worry if your children wiggle in the chairs or make a little noise! We invite you to keep your children in our service and encourage you to help them understand what is going on, sing the songs with you, and participate in worship. We believe that children learn best how to love God and worship him by imitating you, and there may not be a more important time for you as a parent to disciple your children than during Sunday morning worship. There are many parts of our service that remain the same every week, giving our non-reading children plenty of opportunities to fully participate. In addition, we have coloring sheets and crayons available in the back for your use throughout the service. Also, we have a nursery program during our worship service that is set up to serve your children from birth to 3 years old. All nursery volunteers have been through both background checks and Ministry Safe training. Does Colleyville celebrate the Lord’s Supper? Yes! At Colleyville we joyfully receive the Lord’s Supper every week. Does Colleyville offer Sunday Morning classes? Yes! Each Sunday during the school year (September-May), we gather at 9:40am for Sunday School. We begin with a time of acoustic singing together in the Sanctuary, and then split off into various classes. We offer classes for children ages 2 years old through High School, and also a separate class for adults. In addition, we offer an infant and toddler nursery during the Sunday School hour. We believe that the Sunday School hour provides us with an important time of Christian education, discipleship and fellowship outside of our normal worship service. Our logo is a modern interpretation of a classic Protestant symbol. 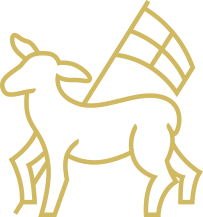 The image of the lamb and the cross banner was first used by protestant reformers in central Europe in the 15th century. These reformers were forerunners of men like Martin Luther and John Calvin, who would eventually lead the Reformation movement of 16th century, from which our own church is descended. Our logo reminds us of several important realities. First, the image of the lamb is given to us in the Scriptures as an image of the Risen Christ. Here at Colleyville, we believe that Christ is our life, and the image of the joyful and victorious lamb reminds us of this central reality. While we may know death and sorrow in this world, this remains true: we are those who have been hidden with Christ in God, and when the Christ who is our life appears, we also will appear with him in glory. Second, the cross emblazoned banner carried by the lamb reminds us that the Christ who is our life is not only the victorious lamb, he is also the lamb who was slain, the crucified one. We believe that it is in the cross that the eternal and triune God himself, the maker of heaven and earth, most fully revealed his own character in the death of Jesus Christ. It is at the cross where our sins are atoned for, at the cross where we find peace with God, at the cross where, in the person of Jesus, we most vividly see the character and love of our God for us. Third, the image of a lamb who is moving forward in space and time reminds us of the reality that we go out from our worship and life together to follow the lamb who is making all things new, to follow him our work, our neighborhoods and all our various callings, trusting that our labor is not in vain, and indeed, the same Jesus Christ who was crucified and raised on the third day will one day return to raise our very bodies from the dead and complete the renewal of all things.